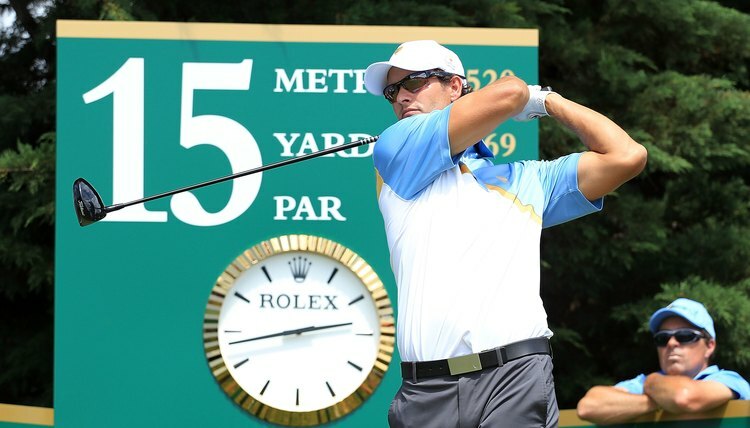 Timing is a vital part of a good golf swing. You know something is wrong with your golf swing, but you just can't put your finger on it. You start hitting shots a lot shorter, and the ball seems to fly like a duck rather than a rocket. What's worse is your scores begin to soar along with your handicap. What you don't realize is that your swing is made up of several moving parts, and when they do not happen in the correct order, your golf swing is said to lack timing. Here are two drills that will help you regain your swing. Use a 5 or a 6 iron and address the ball with it about in the middle of your stance. In addition to that ball, place another one right behind your clubhead. As you take the club back, you will also move the second ball back. You should not begin to hinge your wrists or begin moving your shoulders and hips until the ball is out of the way. Take the club to the top of your swing, then the first motion of your downswing should be the shifting of your hips (weight) toward the target. Continue with your downswing but keep the angle created by your wrists until your arms are horizontal. Then release your wrists, creating a “whipping” action as you reach the ball. Make sure at that point that the clubface is pointed at your target. Upon the conclusion of your swing, your body should be facing the target and all of your weight should be on the target's side. Do not try to slow down your swing if you have lost your rhythm. That is a good thing to do, except if you fail to slow down your arms, legs and shoulders at the same time, that will lead to even worse timing, and it is difficult for you to improve. Tape or burn a CD of a rendition of your favorite song, but make sure it has a strong beat like a waltz or “Mack the Knife.” Place a CD player or a tape recorder across from you at a driving range, and with a lofted club but without a ball, begin making rhythmic swings to the song. Do this about 50 times until the swing is second nature to you. Line up about a half-dozen balls next and assume your stance with the balls just inside your front heel. Then hit each ball while humming the song, remembering the tempo that you used when you swung without the ball. Start with a low iron and gradually work your way up to hybrids and finally your driver. Always keep the swing at the same tempo, regardless of what club you are hitting. Notice the difference in the way you swing the golf club. Many golfers will see a difference immediately after doing this drill, while others need to practice it repeatedly until it makes a difference. Eventually, you should start swinging more rhythmically, and all the movements you have learned will be applied in the correct order.